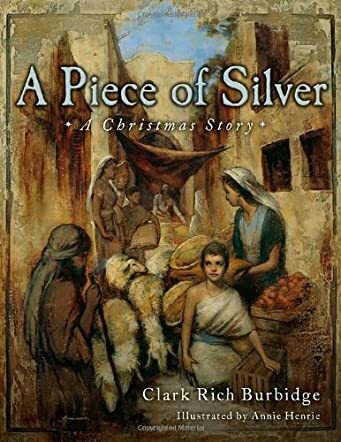 "A Piece of Silver: A Christmas Story" is the beautifully illustrated story of a homeless young boy named Daniel Ben-Yosef who curls up to stay warm and sleep in a stable one night and witnesses the birth of Jesus Christ. Daniel has a small silver ornament that hangs around his neck with a piece of twine that his deceased mother once gave him. This he gives to the baby Jesus, tying it around the holy infant's neck. As the years go by, Daniel tries his best to live a good life but he often "fell into paths that were dark and dangerous." Eventually, Daniel is arrested by the Romans and is condemned as a thief. But will Daniel be saved from the life of a thief by the man who was once the holy child Daniel met years before? Beautiful, soft illustrations help tell the story of Daniel Ben-Yosef and his sad life as a homeless child back in the days when Jesus Christ walked this earth. Many devout Christians will not like how Daniel's life is tied into Our Lord's final hours, but a story is a story and often bends facts into fiction. Daniel survives on the fringe of society, never being able to make something positive of what he was, a homeless boy with nothing to call his own. "A Piece of Silver" is well-written and not overly sentimental, and readers will enjoy reading it and sharing it with young children throughout the year.